Premium drivers that deliver deep rich bass. Secure fit, comfortably stays put in your ears. Bustling with the latest in Bluetooth technology, you’re able to wirelessly connect to your smartphone, tablet, or Bluetooth-enabled device without getting tangled by unnecessary cords. As the latest Bluetooth standard, prepare for less delay when syncing, as well as better battery efficiency for up to 8 hours of continuous audio playback from a single charge. Now you can have the sweetest tunes at all hours. Wear it, then walk, run, and exercise away, because it’ll never come off. The improved over-ear, behind-the-head design reduces the chance of the headphones catching on anything or falling out so you can have an interrupted workout. With the built-in microphone, these headphones are for more than just music. The next time you receive a call, pick up directly and start chatting away instantly. If you’re in a noisy gym or running by the road, the CVC 6.0 Noise Cancellation minimizes unwanted noise so you can hear in peace. Agreement: HFP HSP A2DP AVRCP APTX. Operation Range: Bluetooth wireless connecting Up to 30 feet. Playing time up to 8 hours. CVC 6.0 Noise reduction, clear talk while liberating your hands, keeping maximum comfort. 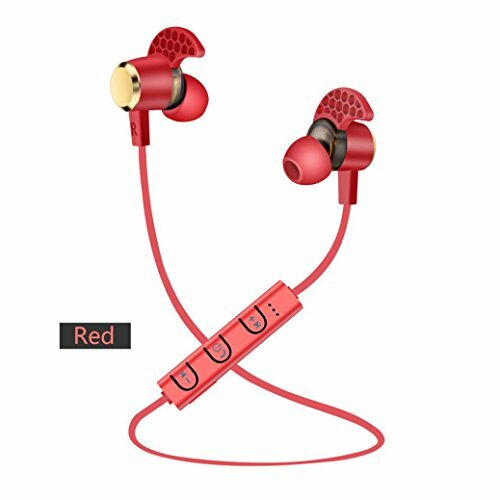 Protect Your Ear: Optimized for extra comfort and fit better in ear earphones, ease the problem of popping out, Soft material to protect ears, make your phone call and music time more comfortable. Easy to Use: Technology with Voice Notification of Incoming Calls and Phone Numbers, Reaching Your Phone, Super Quick Pairing With all Android and IOS mobile.